Tomorrow, from 5 to 8 p.m., Mighty Swell will open for a preview sale and photo kick-off for the blog, Summer of Dresses. If you aren’t familiar with Summer of Dresses, it’s, in a nutshell, a happy place on the Internet where beautiful ladies of all ages, sizes and styles celebrate Minnesota’s shortest season (summer) by sharing snapshots of themselves looking cute in dresses. (If you have a sec, go here to learn more about how the group got rolling.) I can think of a million reasons why you should come by, but I’ll keep this list to 10. 1. Get a first crack at Mighty Swell’s spring collection before we open to the public. Having first dibs on everything, including our cray cray assortment of dresses, is kind of an awesome deal. 2. Get your photo snapped by the ever-lovely Wing Ta, owner of Canary Grey, in front of our springy crepe-paper backdrop. She will make you look good, guaranteed! 3. Mix and mingle with a bunch of vintage-loving ladies. 4. Make some in real life connections with chicks you might only know through Twitter. 5. Beers are $1.50 all night at our next-door neighbors, Chris & Rob’s. Nothing complements shopping and lady time like cheap beers and a big open patio! 6. It’s supposed to be 70° and sunny—perfect dress-wearing weather. 7. It’s totally free to attend! Just do the Summer of Dresses gals a favor and RSVP here. 9. The Pioneer Press and Minnesota Monthly both want to use photos from the kick-off, so if it’s 15 seconds of fame you seek, you should definitely show up. 10. Gals who show up to shop tomorrow will get a 10-percent off coupon redeemable at next weekend’s sale (and our upcoming men’s event on May 18th and 19th). Sweet! I hope you can make it! I’m hopping off to the shop now to stain our new cash wrap and finish up some last-minute merchandising. Fingers crossed I make it home in time to squeeze in an at-home mani (and perhaps a little GCB watchin’!). P.S. 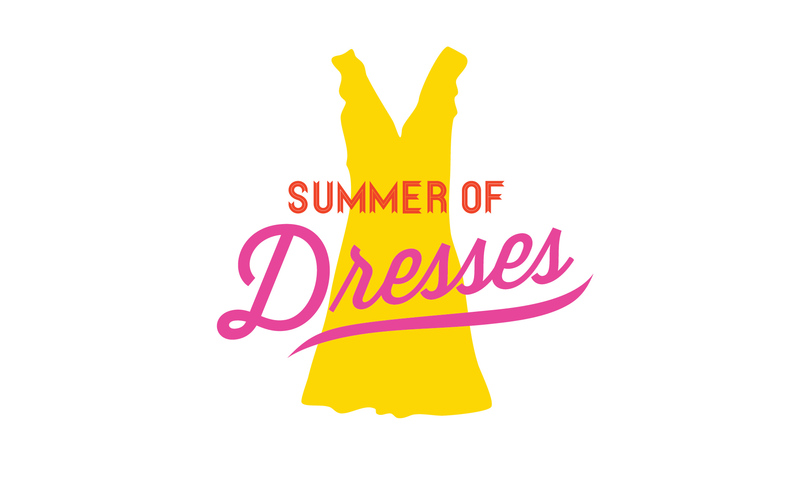 The cute-as-a-button Summer of Dresses logo was designed by Aaron Purmort. This entry was posted in Uncategorized and tagged Canary Grey, mighty swell, pop-up shop, Summer of Dresses, Wing Ta by highplainsthrifter. Bookmark the permalink.